CareerXroads released its annual source of hire report this week and, as usual, the report is full of information about the broader talent acquisition landscape. We’ll get to that in a moment. The beginning of this year’s report spells out the demise of more simplistic views about source of hire tracking: that data is easy to get, that it is reliable across the board, and that it is clean (one source = one hire). If you’ve been in recruiting for more than a decade, you probably know that things weren’t much better before the Internet drove so much hiring activity. I remember laughably tracking sources of hire via a questionnaire we asked applicants (online and on paper) and trying to create data based on employee’s recollections of how they came to apply for their job 5-10 years ago. So no data is perfect but this data is very imperfect. Still, it is the best set of data and analysis we have on sources of hire. With that monster-sized disclaimer out of the way, here are some of the results. 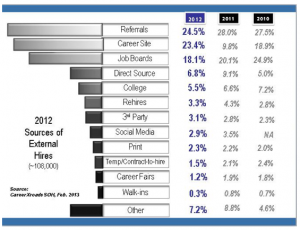 While internal hires accounted for the most hires in 2012, most people take that for granted. Yet, that’s what drives some companies to have a dedicated recruiting team to just seek out internal candidates for roles. For external hires, referrals were nearly overtaken as the top source of external hire, accounting for 24.5% of hires. Career sites made up 23.4% with job boards lagging behind at 18.1%. From those three, source of hire stats drops of significantly with other sources being the top of those below the double digit mark. 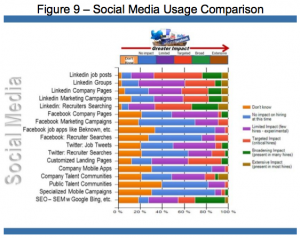 Social media, a source that CareerXroads just started tracking in 2011, dropped from 3.5% to 2.9%. While social media wasn’t necessarily a strong source of hire in their reports, employers believed that social media helped drive and influence other sources of hire (in fact, 7 out of the 11, according to the report). Direct sourcing also dropped significantly from 9.1% to 6.8% in 2012. However, the survey did indicate that more than 58% of employers had internal sourcing teams (and 11% used outside or contract sourcing teams). Social media has continued to grow in its usage, and we are now getting an idea about what networks seem to work best for getting results. 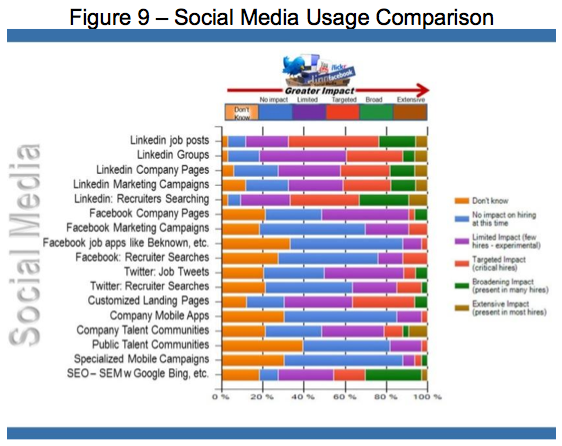 As you can see in the chart on the left, the most effective social media site that impacts hiring is clearly LinkedIn. By a long margin, LinkedIn job posts and using the LinkedIn Recruiter product seems to have the best results out of any of those. But even LinkedIn’s lesser-used features like groups or company pages still beat the effectiveness of Facebook and Twitter. Two other categories that did fairly well were customized landing pages and SEO/SEM campaigns on search engines. While these don’t get talked about as much, you can see that employers rate both very highly in comparison to everything outside of LinkedIn. I don’t pretend to speak for Gerry Crispin or Mark Mehler, but I’d love to get closer to really great data on sources of hire. As relayed in the report, the information often gets collected but the results aren’t always clear (and aren’t always easily interpreted). There’s a good amount of interest in this report from recruiters and staffing leaders who are looking at how they will be investing in the coming years. The data comes from recruiting departments and it is only as good as what you can provide. I think we’d all like to be able to dive more granularly into the social media data and see for certain (or more close to certain) how much of an impact it really plays in hiring. Until then (2014, 2015, or beyond? ), we can read and reread this report and hope to get a hint as to how the market is slowly shifting over time.